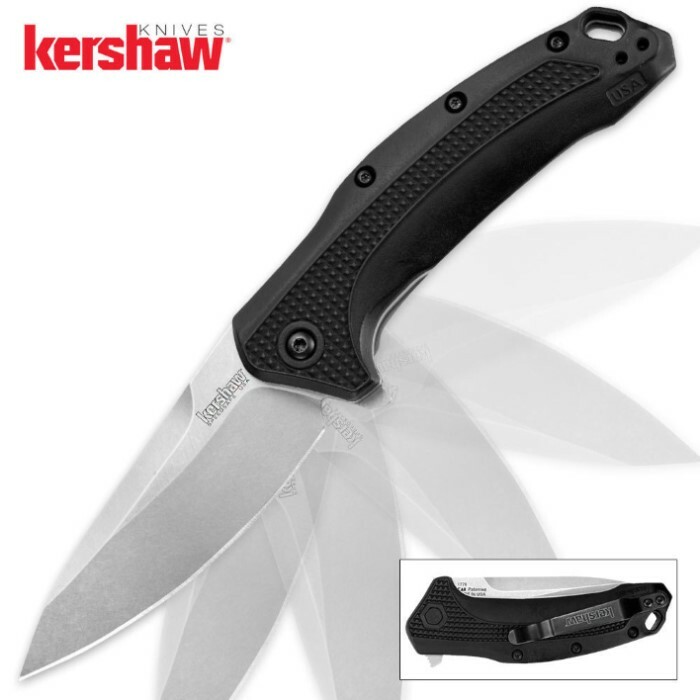 Kershaw Link Stonewash Assisted Opening Folding Pocket Knife | BUDK.com - Knives & Swords At The Lowest Prices! Kershaw bridges affordability and American-made quality with its popular Link model! This top-quality pocket knife was made in Tualatin, Oregon with all the American-made quality and pride you would expect at a price that is affordable to everyday people. These are just a few of the reasons we love Kershaw's Link so much! It also features SpeedSafe assisted-opening and a built-in flipper for fast, one-hand access to the blade. The 3-1/4" blade is crafted of 420 high-carbon steel, making it corrosion resistant with excellent blade retention, and the sleek stonewash finish gives it a contemporary look and feel. The reversible pocket clip allows you to enjoy a left or right-hand carry. You can also clip it to your belt loop or backpack so it's always at the ready. THIS KERSHAW IS BY FAR ONE OF THE BEST KNIVES I HAVE EVER OWNED. IT IS SOLID YET LIGHT, IT IS WELL BUILT FROM THE FRONT TO THE BACK. LOCK-UP IS SOLID, NO BLADE PLAY AT ALL. I HAVE ALWAYS BEEN A KERSHAW FAN BUT LATELY THEY HAVE BEEN COMING OUT WITH SOME OF THE MOST RELIABLE KNIVES AT A GOOD PRICE, EVEN THERE CHINA MADE STUFF IS TOP QUALITY. THANKS BUD-K FOR OFFERING SUCH GOOD RELIABLE KNIVES AT A GOOD PRICE.